A very interesting concept album that leaves you no choice. Sadist is a band formed in Genoa, Italy since 1990 always playing a high-quality Progressive Death metal in the vein of bands like Atheist, Nocturnus, and Cynic just to mention some bands, their work over the years has been very consistent, However, I have personally kept myself away from their work, only focusing on albums like their debut album "Above the Light", released in 1993 by the Nosferatu record label of Italy, now extinct, "Crust" released in 1997 through Dutch record label Displeased Records, "Sadist" released in 2007 by Beyond ... Productions from Italy and lately "Season in Silence" released in 2010 by its current record label Scarlet Records. 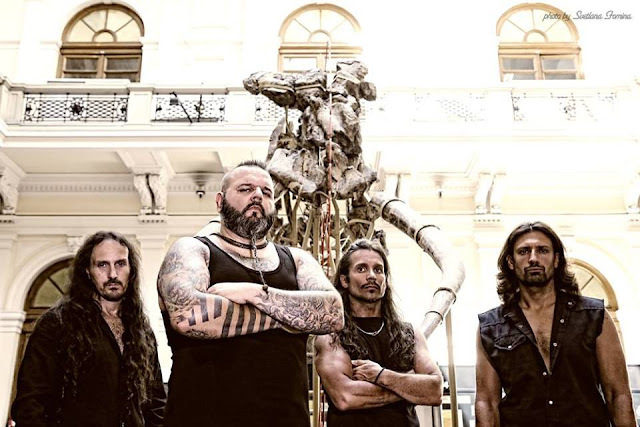 The current Sadist line-up consists of Tommy Talamanca on guitars and keyboards, Trevor Nadir on vocals, Alessio Spallarossa on drums and Andy Marchini on bass. The band's newest album titled "Spellbound" is centered around the life and work of influential filmmaker Alfred Hitchcock. Each of the 11 songs included in the album traces the plot of a Hitchcock movie, including masterpieces such as ‘Frenzy’, ‘Notorius’, ‘The Birds’ and of course ‘Psycho’, with their unique and flawless Progressive Death metal. The album opens masterfully with "39 Steps" a macabre and fearsome piano intro worthy of any suspense episode of Alfred Hitchcock, rapidly is followed by "The Birds" energetic and melodious keyboards create a dense atmosphere along the song, while the guitar works crushing and belligerent, "Spellbound" delivers spine-chilling nuances through its sound full of oppressive terror, "Rear Window" still carrying that grim and sinister sound the crushing guitars meld perfectly with the ambiance while the drum work is outstanding, "Bloody Bates" is totally demented and offers the blackest and morbid moment in the album, most people who were able to appreciate Hitchcock films will know right away what's this song is all about it, "Notorius" is an instrumental piece with heavy progressive elements, leaving aside the death metal components, let's skip to "I'm the Man Who Knew Too Much" which is able to create a darker, brutal and dynamic vibe in the album like no other song, "Frenzy" is disturbingly chaotic interacting with creative and melodic moments to abruptly attack with its classic sound, "The Mountain Eagle" entangles with superb complexity maximizing the outcome and the last track is "Downhill" another instrumental song that worth the time to listen for, and that's how Sadist manages to drive you through a well-defined concept album with one of the most disturbing stories. 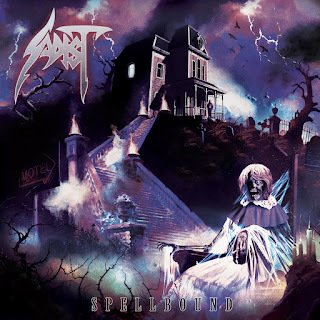 I want to conclude that Sadist been an underrated band, they have been proved themselves once again to be one of the best Progressive metal acts out there, devoted to their roots and firmly stomping as never before, "Spellbound" is a very interesting concept album that leaves you no choice, please don't miss the chance to listen to them.